Our craftsman are experienced in cleaning every type of handbag, from Alexander McQueen to Balenciaga and Chanel. Our process is simple -- remove stains using gentle hand-cleaning techniques, then apply infusing oil and dyes to keep your handbag supple and richly colored. 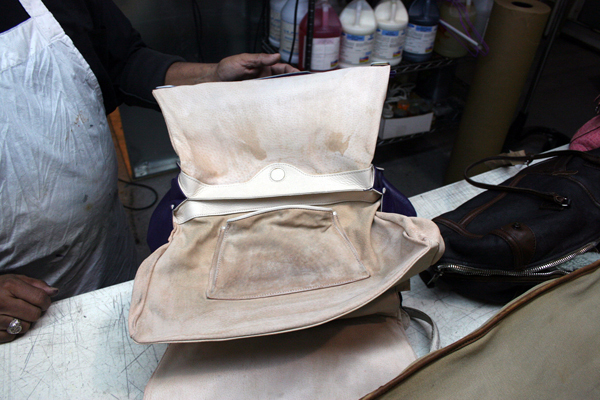 Meurice Garment Care's professional bag restoration can revive nearly any designer bag -- leather, suede, or otherwise. Whether the stain is caused by denim transfer, cosmetics, or everyday wear – our experts will restore your bag to its original condition and send it back to you refinished and restored. Repairs? Meurice can handle those, as well. Call us today to see how Meurice can revitalize your luxury investments. Not local to New York? - We can even send you a shipping label for your convenience. My bag is very worn and has multiple stains. Can it still be restored? You would be amazed at some of the handbags and purses we've restored. Our skilled technicians take pride in their craft and specialize in taking the most worn and stained bags back to their original condition. Click here to see a sample of our work. What should I expect during a restoration procedure? Meurice does everything from minor repairs, such as spot cleaning, seam stitching, and leather moisturizing, to major repairs like fabric restoration, repainting, color matching. Our expert Hassan painstakingly matches your handbag's original color. Click here to see the outline of our entire process, from start to finish. Water stains? Dirt and scuffing? Our leather and suede cleaning procedures can remove nearly every type of handbag stain. At Meurice, we clean fabric handbags using a delicate water-based method to protect the integrity of the fabric. Following the cleaning, we apply a durable stain protectant to prevent further stains. As you can see from this collection of Hermes bags we cleaned, we've created some incredible results that are hard to match. Each leather handbag is hand cleaned, paying special attention to hard to remove stains. Our expertise with leather handbags is difficult to compare, as we have been cleaning suede and leather in house for decades. Our master craftsman have the ability to match handbag colors exactly in order to cover difficult stains and retain the original look and feel of the leather. Every suede handbag is evaluated to determine which one of our cleaning processes is best suited for that particular type of skin. Oils and colors are restored to the bags after hand cleaning to make the appearance look as rich as the day you brought it home. For best results, suede handbags should be cleaned as soon as they are soiled. Your investment in crocodile leather handbags is intended to last a lifetime. Our procedures breathe new life into your handbags and maintain their original shine. We employ the very highest level of skill and craftsmanship to give your crocodile skin handbag the proper care and precision. We have a track record of handling rare and valuable bags from every designer.